Sunday, September 22 1907 -- Next week the old master, Joe Gans, goes up against one of the few lightweights he hasn't yet gotten around to beating, George Memsic. Memsic is said to be in the best condition of his career, but will he be able to put asunder the seemingly unbeatable Joe Gans? Stay tuned sports fans! Obscurity of the Day: What Can a Poor Woman Do? Harry Lewis had one of those styles that is easiest to describe in terms of his contemporaries. Take equal measures of F.M. Howarth and William Marriner, then combine with a dollop of Nell Brinkley. Harry liked to apply his skills to drawing pretty girls, or at least what a pretty girl might look like if she had a giant head (or are those normal size heads on tiny, withered bodies? Such existential questions no doubt plagued him as they do me). His odd creations were all over the Hearst papers for a short while, mostly confined to 1909-10. What Can a Poor Woman Do? 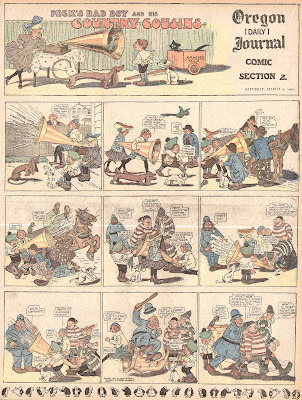 was his longest-running strip in the period, it ran in the New York Journal from April 16 1909 to September 8 1910. Lewis' work also popped up frequently in the humor magazines and he was a mainstay with his newspaper Sunday magazine illustrations. Hello, Allan----So why was it important that we know that the bolt of cloth was moved to the man's room? Then the girls are hanging out in the husband's room, I suppose? ----Cole Johnson. Kinda looked to me like Lewis started out with a different gag in mind, then switched gears. Since it ended up a pretty weak gag anyway, the original idea must have really been a stinker. George Peck created Peck's Bad Boy as a series of humorous stories in his Milwaukee-based weekly newspaper, Peck's Sun, in 1878. Although originally published in a rather obscure venue, the stories gained a huge nationwide audience when they were collected in book form. The Bad Boy, as the name implies, was a kid who loved to get in trouble, more or less a rural American version of one half of Max and Moritz. Although rarely cited as an influence on early comics, the popularity of the Bad Boy likely had as great an impact on American cartoonists as Wilhelm Busch's creations. Certainly Peck's books were outselling the Max and Moritz reprints in this country by a wide margin. The Bad Boy left the comics page field to his many doppelgangers until 1906. That year Joseph B. Bowles, Peck's publisher at the time, licensed the character's use in comics. 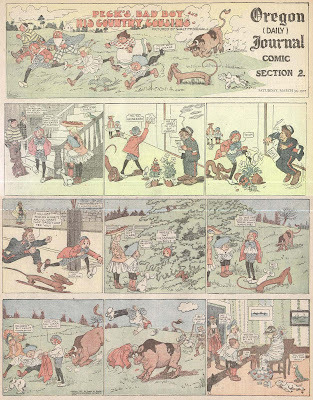 The Sunday page began on June 10 1906, distributed by Philadelphia's North American Syndicate and penned by their star cartoonist, Walt McDougall. The series went on for exactly one year, ending on June 9 1907. According to the Overstreet Price Guide there were no less than nine contemporary reprint books featuring the strip. I assume the material they reprint overlaps somewhat since there were just 52 pages of material available. The series seems to have done well, popping up both in papers that took the North American service for their whole section and those that used other services. That combined with the number of reprint books would seem to classify the series as a success, but for reasons unknown the contract was not extended. Perhaps Peck wanted too much money at the renewal. Purely a guess, but maybe the actual reason was that Peck was unhappy about the way McDougall handled the work. The strip reads very much like a purely McDougall production, I very much doubt that Peck wrote the material. Not having read Peck's stories, I can't say how well he followed Peck's lead but McDougall's stylistic stamps are in abundant evidence. Thanks very much to Cole Johnson, who supplied the samples above. I have read a number of the stories in an old collection. They're told first-person by Peck's Bad Boy, and completely focused on son vs father. The father is selfish and vain and often drunk, the son full of the kind of mischief that would lead to juvie hall these days, and by the end of the chain of escalating events, the father is usually ready for the hospital. Not at all gang of kids oriented. Considered one of the premier newspaper cheesecake artists of the 1930s, Jefferson Machamer suffered the fate of many who were stars in that genre. Charles Dana Gibson, John Held Jr. and others found that the public's taste for pretty girl drawings was fickle. After years at the top of the heap, each would abruptly discover that their particular brand of cheesecake had been branded obsolete. Machamer's Gags And Gals page, a staple of the New York Mirror's Sunday comic section, ended in 1938 after a seven year run, but Machamer evidently saw the writing on the wall. He took a cue from the experiences of his predecessors and tried to branch out. In 1936-38 he wrote and acted in a series of Hollywood short comedy films. Unfortunately this new career fizzled along with Gags and Gals, and Machamer was left looking for a new assignment. That came at the beginning of 1940 when McNaught Syndicate began distributing his last comic strip, Hollywood Husband. This tale of a star-struck woman who drags her husband to Hollywood was a slice of life for Machamer, who was married to movie actress Pauline Moore. The story plays out as a light-hearted version of A Star Is Born, but you can see an undercurrent of Machamer's distaste for Hollywood glitz in the story. The strip began as a daily-only on January 29 1940, and a Sunday seems to have been added starting April 28. The art often seemed a bit rushed, and Machamer couldn't seem to make up his mind whether he wanted to play the story for comedy or drama -- not a good start for a new feature. The strip ended up lasting less than a year, ending on October 27. PS -- the bane of website cross-pollination will have you assuming that Machamer did a feature called The Baffles for the Los Angeles Times in the early 40s. I was able to trace this factoid back as far as Maurice Horn's World Enyclopedia of Cartoons, in an entry credited to Rick Marschall. The description there, "a small-town family in Hollywood", sounds to me suspiciously like Hollywood Husband with a different title applied. The fact that the essay makes no mention of Hollywood Husband is another tell-tale. I checked Dave Strickler's Los Angeles Times index and found no mention of The Baffles, but he does show that Hollywood Husband did indeed run in that paper. Until evidence to the contrary shows up, I'm going to put Machamer's The Baffles down as another phantom feature. THE SAFFLES = THE BAFFLES. Google news archive shows the NYTimes Machamer obit of August 17, 1960 may have been the origin of The Baffles by Machamer "factoid". I don't have access to the entire obit. I'm afraid I don't follow your msg. What's this about The Saffles? Thanks DD. At least the World Encyclopedia didn't make it up whole cloth! Oops - sorry Fortunato -- I see what you mean. The last name of the characters is Saffle! OT - have you ever seen the George Swanson weekly strip Elza Poppin I have at my blog today? You have a mention for it in one of the E&P articles, but that just mentions comedians Olson and Johnson, who probably were associated in name only. You betcha. Elza Poppin had a nice long 5 year run as a daily from King Features. Ving Fuller did the first six months, then Swanson got it. The strip began because of the popularity of their Broadway show. The movie which came in 1941 was a bit of a flop. The duo's madcap comedy that went over so well on stage fell flat on screen. I stayed up late once to see the movie and it was pretty bad -- the screwball comedy seemed forced and over-scripted. 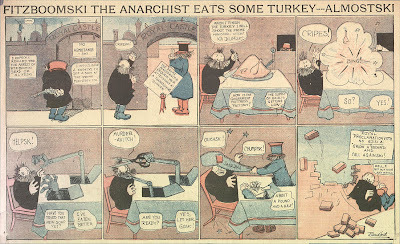 Anarchists, popularly known as crazed bomb-throwers to middle-class Americans, had become a national obsession following the 1886 Haymarket riot in Chicago. A group of anarchists and trade unionists had staged a rally in the city only to be harassed by police. In the ensuing melee someone set off a bomb that killed eight police officers. It was impossible to determine the actual bomb-thrower, but police took the convenient shortcut of arresting eight rally organizers and charged them with the crime. Seven were executed while the eighth committed suicide in jail. From that date on socialists, unionists and other assorted 'radical' groups were all branded anarchists and excoriated in the popular press as wild-eyed maniacs. Things only got worse for these groups, most of which, at least in the U.S., were actually social reformers and not revolutionaries, when the eyes of the world were focused on troubled Russia in 1905. In that year a large number of disparate groups, including anarchists, Bolsheviks and a plethora of splinter groups staged the Russian Revolution of 1905. That title makes the events of that year sound like an organized effort, but it was actually utter chaos, with bombings, assassinations and terrorism directed not only at the government but between and among all these groups as well. The headlines coming out of Russia further defined anarchists in the U.S. as crazed bomb-throwers. Along with hatred, contempt and fear, the image of the insane bomb-throwing terrorist also inspired the type of black humor seen here in Walter Bradford's Fitzboomski the Anarchist (you thought I'd never get to the strip, eh?). Bradford's new strip debuted in the Philadelphia North American on October 22 1905, just a week after Russian revolutionaries had presented the czar with the October Manifesto, which promised to end the violence in exchange for basic civil rights for citizens. Bradford, a born jokester who could find the humor even in the dark events on the other side of the globe, had Fitzboomski trying all sorts of nefarious plans to blow the "prime minister-a-vitch" to bits. In plots that prefigure Mad magazine's Spy vs. Spy, his plans were constantly subverted by the minister's own counter-plots. With the October Manifesto signed by the czar, (relative) peace came to Russia and Fitzboomski threw his last bomb after just six episodes on November 26 1905. But in January 1907, with tensions in Russia once again coming to a head, Bradford reactivated his home team for a second engagement. 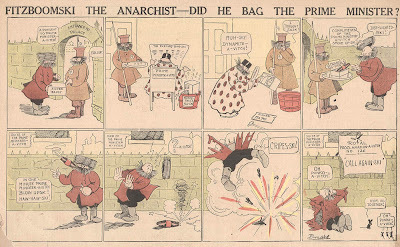 The new version of the strip, now slightly retitled as Fizzboomski the Anarchist, ran from January 20 to April 7 1907 (except for an apparent leftover that didn't appear until June 28 1908). A tip of the ushanka to Cole Johnson for the scans. This is another one I've been wondering about. I have a few of these, I think they must be from the revival. So sad that you speak so fondly of scum, socialist and their "progressive" ilk. 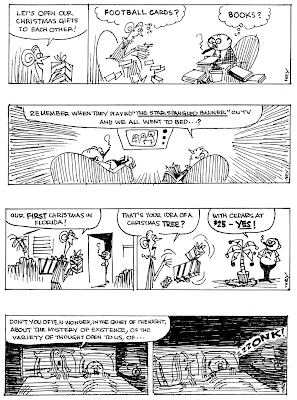 Harry Martin, the man who created the St. Louis Post-Dispatch's Weatherbird, has been discussed before on the blog (It Happened In Birdland), and here's another of his 'bird' comic strips. Martin used birds in much the same way that Gus Mager used monkeys -- the species of the characters began as part of the gag, but then as the years went on both creators seemed to stick with their animal characters more out of habit than for any plot-related reasons. 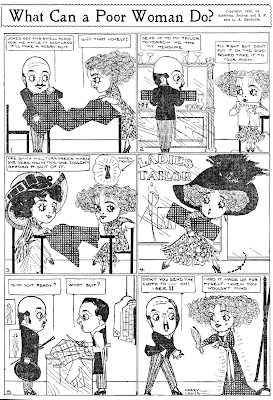 Inbad The Tailor ran from April 27 1911 to June 18 1912 in Hearst's New York American. As you can see from the samples above that date to the middle of 1911, the tailor aspect of the strip didn't last long. Inbad himself was often jettisoned from the strip in favor of two young lovers, Dickie and Duckie.